Lightweight, portable, and stable, the new inflatable Osprey Stand Up Paddleboard from The Creek Company is designed with the angler in mind. Providing a unique way to cover water as well as greater visibility, the Osprey is definitely worth checking out. Stability and performance innovations energize personal fishing craft category. 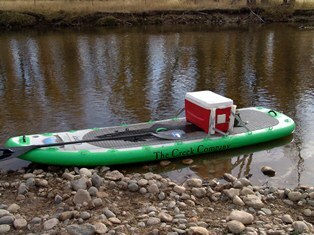 CARBONDALE, Colo. (February 1, 2012) Steamboat Springs, Colo.-based The Creek Company brings 25 years of expertise in the inflatable personal fishing craft market to the new, exciting category of stand-up paddling with the release of its new inflatable Osprey Fishing SUP, the most stable and versatile fishing SUP on the market today. With a unique fishing-specific design, the Osprey is lightweight, portable, super stable and easy to use. Its stealthy design lets you cover more water with a paddle than other fishing craft and offers greater visibility for sight-fishing your favorite flat. Other fishing-specific features let you fully customize your fishing platform for your specific application, including D-rings for securing such gear, dry bags, and three Scotty mount pads for rod holders, anchor drop, GPS’s, fishfinders and more. The Osprey also features a sport tail design and a stomp pad allowing for easy wave surfing and river maneuverability on non fishing days! At 11’ long and 38” wide, the uber-stable Osprey lets you stand-up paddle to your favorite fishing flat with clear visibility and cast large flies with full range of motion to everything from tailing bonefish to rising trout. When you need a break or to change flies, you can sit on a cooler strapped amidships. It’s perfect for mountain lakes and rivers as well as coastal waters and bonefish flats. Plus, at only 38 lbs it’s also one of the most compact SUPs on the market, rolling up for easy car transport and garage storage back home or even airplane transport to your favorite fishing destination. The Osprey will be available online and at most specialty outdoor retailers and fine tackle shops. Multiple D-rings and bungee cords for securing gear like a cooler/seat, dry-bags, etc.